On February 12th, American Idol was in Orlando, Florida and not in Hollywood! Walt Disney World's - Disney Hollywood Studios was home to the Grand Opening of the American Idol Experience and all I can say is the star power was in the house! Kelly Clarkson, Carrie Underwood, Jordin Sparks, Fantasia Barrino, David Cook, Ruben Studdard, Taylor Hicks, Ryan Seacrest, Paula Abdul and many more were here to kick off the American Idol Experience. The event opened to a packed house and former American Idol winners and contestants were on hand to inspire others to follow their dreams and listen to future American Idol hopefuls. Just so you know the winner of the American Idol Experience gets a Golden Ticket to perform for the American Idol judges next fall without having to wait in line for hours! So it possible that the next American Idol could come from the American Idol Experience. Learn more about the American Idol Experience. Photos from the Opening Night! While Simon was not always a fan of Carrie Underwood's country performances on American Idol, Carrie has gone on to become one of the Top Musical Acts since she left Idol. And she looks lovely in this red dress with Mickey Mouse by her side. David Cook and Carrie did a duet on stage - Fleetwood Mac's - You Can Go Your Own Way, check it out below! I love Paula but her style is well her own and it's hard to decide who is the biggest character in this photo. Reports are that Paula had a wonderful visit and we would love her to come visit more often. 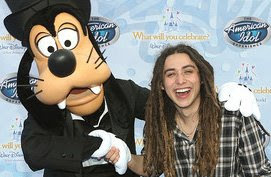 Well it wasn't just American Idol winners attending the premiere but also many fan favorites like Jason Castro, who always reminds me of Jar Jar Binks from Star Wars, Sajay and his ever changing hair and many more. 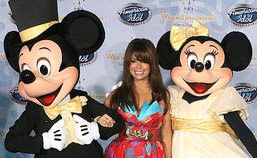 Disney has done a wonderful job in creating the American Idol Experience and making it a very exciting attraction that really could influence the next American Idol. But there is something you won't find at the American Idol Experience, BAD singers or people just trying to get tv time. Unless someone pulls a fast one, expect good and above average talent to entertain you at the American Idol Experience only at Disney's Hollywood Studios. Learn how you can be a contestant on the American Idol Experience.